A Hollywood star and a co-owner of the Pittsburgh Penguins say paper made from agricultural waste is no longer pulp fiction. In June 2012, villagers in Central China found themselves choking on an unusually thick and mysterious haze. At the best of times air quality in the region is poor, but local authorities described it at the time as the worst case of “black carbon” pollution in a decade. Visibility was so low that some highways were forced to temporarily close. Rumours were quick to spread. Had there been a large environmental accident? The culprit, it turned out, was much less nefarious but no less concerning to those with no choice but to inhale. Wheat farmers, burdened with leftover straw after the seasonal harvest, were burning the stuff en masse by the roadside. Few may realize it, but the practice of burning wheat straw and other crop residues is common throughout both the developing and developed worlds, including North America. Not only is it a major source of air pollution, it’s a massive waste of a valuable non-food resource in the eyes of environmentalists – not to mention eco-minded entrepreneurs like Jeff Golfman. Sitting at a cafe in Toronto, Golfman matter-of-factly lays out the implications while picking apart a stale muffin. A ballooning global population, he explains, will mean rising worldwide demand for products traditionally made out of wood or wood fibre. Meeting that demand can’t be sustainable if it means harvesting forests that are already under severe pressure. “It’s inevitable that agricultural fibre, such as wheat straw, is going to have a greater role to play,” he says. So inevitable has it been in Golfman’s mind that in the mid-1990s he embarked on a mission to produce high-quality paper made out of “ag waste.” He set the bar high: The end product had to be comparable in quality and cost to paper already made from recycled wood fibre, but the process and materials used would need to consume less energy, water and harmful chemicals. His paper would be complementary to products made from recycled wood and paper fibre, creating another economical alternative to using pulp from virgin trees. True, non-tree paper already exists in the marketplace. Sheets made from sugarcane, bamboo, hemp straw and wheat straw have been produced in China, India and dozens of other countries for decades. In North America, niche paper products made out of linen, cotton and even elephant dung are available for purchase to anyone willing to pay the premium. “There are over 200 pulp and paper mills in the world using some percentage and form of ag fibre, but most of them are doing a very small amount,” says Golfman, who has spent more than 15 years studying the market. The number drops dramatically when stricter criteria around quality, price and environmental performance are applied. Many mills operate on coal power, and production processes still rely heavily on chlorine bleaching. The resulting paper typically contains 10 per cent or less agricultural fibre, which is blended with wood fibre that is often not certified as sustainable by bodies such as the Forest Stewardship Council (FSC). During the late 1990s, Woody Harrelson was certainly thinking about it. Teenagers may know him as the booze-swilling character Haymitch in The Hunger Games movies, but to their parents he’s the dim-witted yet lovable bartender on the 1980s sitcom Cheers. After years of climbing bridges and lobbying U.S. congress in protest to the harvesting of old-growth forest, the Hollywood actor concluded that environmental activism, as necessary as it is, wasn’t getting the job done. He decided to focus more of his personal energy on finding market solutions to deforestation, one of them being the economical and sustainable production of paper using alternative fibres. A day later Harrelson was on the phone with Golfman and they immediately hit it off. Within two weeks, Golfman found himself in Boston meeting the Oscar-nominated actor. It didn’t take long before a deal was struck on a handshake. Harrelson invested and became co-founder of what would become Prairie Paper Ventures. The founding team includes lifelong conservative politician Clayton Manness, who served as Manitoba’s finance minister between 1988 and 1993. Together, the three have spent more than a decade – with financial support from the Manitoba and federal governments, including a grant from Sustainable Development Technology Canada – working to turn their straw paper vision into a viable commercial product. The efforts of Prairie Paper have been strongly supported by Canopy, a not-for-profit environmental organization that for the past eight years has been trying to put the straw waste option on the radar of government, corporate decision makers and consumers. To help raise awareness, Canopy led an effort in 2011 to get a special edition of Margaret Atwood’s In Other Worlds book published on straw-based paper. Special straw runs of Yann Martel’s Life of Pi and Alice Munro’s Dear Life were made available earlier this year. Forests could use the help. About 40 per cent of the annual industrial wood harvest goes toward making paper and paperboard products, with the United States and China representing 40 per cent of global production, according to the 2012 instalment of WWF’s Living Forests Report. Paper production growth has somewhat levelled off in North America, but in China and other Asian markets demand for paper packaging, tissue and printing paper is on the rise. The good news is that paper recycling is carrying more of the fibre load. The amount of recycled fibre used in global paper production jumped from 43 per cent to 53 per cent between 2000 and 2010, and groups such as WWF remain hopeful it can reach 70 per cent by 2020. But recycling alone is unlikely to halt deforestation, given the seemingly insatiable demand that the Chinese have for virgin and recycled fibre. Increasingly, it imports recycled fibre from North America, which has the effect of driving up the price. For this reason, even some established pulp and paper producers recognize that wheat straw waste and other agricultural residues are likely to become important ingredients in the papermaking cookbook. Dell Computer is just one company already using wheat straw fibre in shipping boxes. As part of a program it launched in August, Dell will initially require that boxes contain 15 per cent wheat straw blended mostly with recycled paper fibre. The percentage of straw fibre is expected to increase over time, the company says. The computer giant is getting those boxes from Taiwanese papermaker Yuen Foong Yu Paper (YFY), which this summer opened a facility in China’s Yangzhou city that is dedicated to making pulp out of wheat straw. Hewlett-Packard and Procter & Gamble are among other international companies interested in the process, the company says. “There’s no question that in the long run there’s a place for it,” says Graham Kissak, director of risk management and environment at Canadian paper manufacturer Catalyst Paper. Where Kissak parts way with straw proponents like Golfman is in his use of the words “in the long run.” He says Catalyst has looked at the potential of agricultural fibre seriously. But the company still holds the belief that it will be at least five to 10 years before such fibres become more than just a niche product, at least in the North American context. Then there’s the issue of storage. The seasonality of harvests means that materials collected must be stored somewhere if a paper mill is to operate year-round. While wood chips can be collected all year and stored outside, wheat straw must be kept dry and is more susceptible to mould and discoloration. There’s a big cost, however, to building and maintaining physical storage. “For people wanting to make straw-based papers, I think their manufacturing costs may be higher than they anticipate, simply because of the logistical challenges,” Kissak says. And is the wheat straw option as sustainable as it seems? Some argue that removing agricultural residue from a farmer’s field depletes soil nutrients such as nitrogen, potassium and phosphorus, which are necessary to sustain healthy crop yields in future years. That may create a need to add more commercial fertilizers to the soil, making things potentially worse from an environmental perspective. One of many issues to consider, no doubt. But that didn’t stop big-box retailer Staples from announcing in August 2012 that it would begin selling Prairie Paper’s first commercial product – branded Step Forward Paper – in Canada. The photocopy paper contains a blend of 80 per cent wheat straw and 20 per cent FSC-certified fibres. The Staples deal, which cemented a partnership with major paper distributor Unisource Canada, was huge for Prairie Paper. 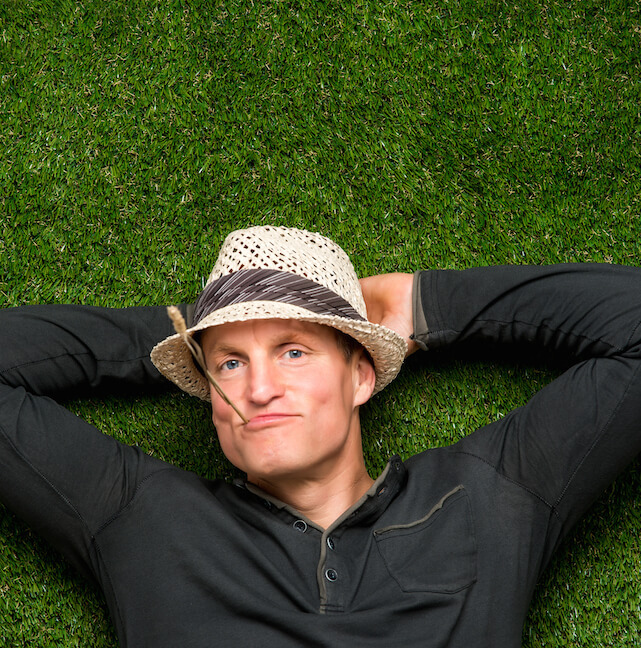 The fact that Woody Harrelson was part of the story guaranteed widespread media coverage, which created much-needed awareness of the product. Currently, Prairie Paper gets its product manufactured at a mill in India. Golfman’s objective is to build the company’s first paper mill in Manitoba’s Red River valley, where hundreds of thousands of tonnes of wheat straw are burned annually. But that means demonstrating enough purchase orders to support a 300,000 tonne per year operation. Canopy’s Rycroft is convinced there’s more than enough demand, based on surveys it has conducted with 700 companies. She figures the market right now could justify at least four paper mills handling 1.2 million tonnes. Anticipating this, Prairie Paper has begun to create more choice for potential buyers. In addition to copy paper, it has started producing folio-sized paper called Step Forward Professional Grade that can be used to publish books, brochures, reports and magazines. 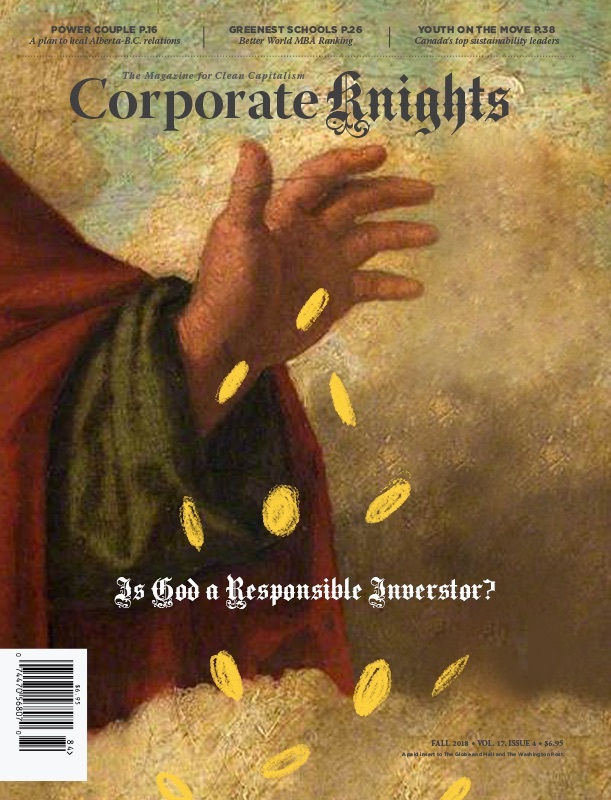 With this issue, Corporate Knights is the first magazine to test the new paper, which is currently made from 60 per cent straw. Our hope is that it will convince others to follow. Toward that cause, Golfman and Harrelson have been busy raising funds that can be used to boost marketing, inventory levels and customer support. This summer, they attracted eight new private investors, including multibillionaire Ron Burkle, the supermarket magnate that co-owns the Pittsburgh Penguins team with former hockey star Mario Lemieux. Tom Kartsotis, founder of trendy clothing and accessory designer Fossil, has also invested. At the same time, Dave Richardson, part of the family behind James Richardson & Sons, the largest privately held grain company in Canada, has joined Prairie Paper’s board of directors. “It’s a unique combination of people that the paper industry has never seen before, and it brings us to a whole new level,” says Golfman. Asked about the transportation and logistical concerns raised by companies such as Catalyst, Golfman addresses them head on. Prairie Paper restricts its straw collection to farms that are within a 75-kilometre radius of where the paper is made, he says. The straw would come from existing wheat farms that are searching for better ways to manage their straw waste. Farmers would also likely store their own straw, making deliveries or accepting pickup on a pre-determined schedule. This means Prairie Paper wouldn’t need to build a massive centralized storage facility. As for fear of nutrient depletion in soils, it wouldn’t be an issue in Manitoba. Eric Liu, a business development specialist within the province’s agricultural ministry, says the Red River valley is an area filled with heavy, nutrient-rich clay soils. The reason why farmers there burn much of their wheat straw is because they don’t require it as a soil booster. “The only fibre we are taking is left over from what farmers don’t need or want,” explains Golfman, adding that it’s not in the interest of farmers to steal nutrients from their own soils. But Golfman knows that his company’s claims need to be backed up with proper study. To that end, Prairie Paper had carbon-management consultancy Offsetters do a lifecycle assessment of Step Forward Paper in 2012. It found that the company’s wheat straw paper, when measured against 100 per cent virgin fibre paper and 30 per cent recycled paper, had the lowest environmental footprint when it came to greenhouse gas emissions, wastewater production and use of non-renewable energy. Of note is that the study only looked at paper produced from the Indian mill the company currently uses. Transportation from India represented about 12 per cent of total product emissions. Golfman says the planned Manitoba mill eliminates much of those emissions, but more than that, it will be built from the ground up to be an off-grid facility powered by renewable energy. It will also be chlorine free, sulphur free and closed loop with its water use, and eventually will boost the percentage of straw fibre in its paper to 100 per cent. That last point is crucial, says Catalyst’s Kissak, explaining that “greenness” alone isn’t what drives most buyer decisions. “Our customers say that’s nice but, at the end of the day, price is 99 per cent of their purchase decision.